If you’re planning to move to Australia, you probably have all the information you need with respect to visa, housing, culture, food, standard and cost of living, etc. Can you take your pets with you to Australia as well? The answer is yes, you can! If you adore your pet and don’t want to leave them behind, you are not alone. 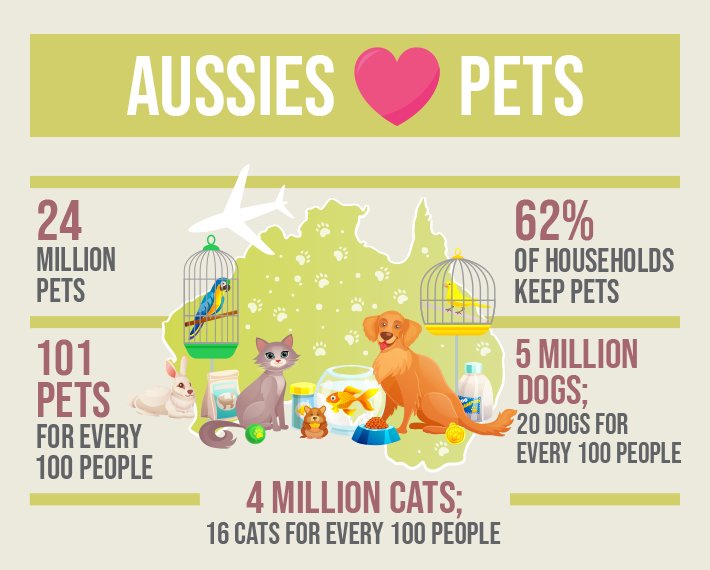 Plenty of people move to Australia along with their pets and you can too. All you need to do is educate yourself on what needs to be done, have a plan, get all the paperwork in order and put aside some money for moving your pet to Australia. In this article, we will give you all the information you might need to take your pet to Australia. We assume that you have already investigated the medical, social and climate-related aspects of the move and have found them favourable for your pet. Rural Australia has plenty of wide open spaces for domesticated animals. But even if you’re moving to a large city like Sydney, Melbourne or Perth, you don’t have to worry about the comfort and happiness of your pets. In Australia, dogs are allowed – and even welcomed – in most public places such as parks and beaches. All other places where dogs are either not allowed or must be kept on a leash by their owners, display clearly marked signages that indicate these rules. If you are moving to Australia with a pet, you must comply with certain rules and regulations put in place by the Department of Agriculture and Water Resources, before you can be reunited with your pet. The import conditions imposed by the Department of Agriculture and Water Resources depend on the category of exporting country as well the type and breed of pet. All exporting countries fall into one of three groups and therefore the country you are moving from determines how easy or difficult it could be for you to take your pets to Australia. In any case, pets coming to Australia must be accompanied by a valid import permit and must spend a minimum of 10 days at an official post-entry quarantine facility. Pet owners must note that their dog or cat must be granted an import permit before the pets arrive in Australia and enter quarantine. The conditions for importing dogs of assistance are slightly different from those of regular pet dogs, although these dogs also require an import permit. First, the importer must provide evidence that the dog is trained to assist a disabled person and that it meets the standards of hygiene and behaviour required of an animal in a public place. Then, supporting documentation must be submitted, including a declaration form and training form for the dog and a medical history form for its disabled owner (handler). Since not all exotic animals are banned, owners can check the eligibility criteria and permissions through the Live Animals and Reproductive Material or the Biosecurity Import Conditions System (BICON) web pages of the Department of Agriculture and Water Resources. Now that you know the basics, check out the next section for details of regulations and documentation that you must complete before and after you and your pet arrive in Australia. In the final section, we provide some useful tips on how you can make the move to Australia easier and less painful for your beloved pet. Check if your pet is allowed to be imported into Australia in the first place. Consider its breed and your originating country before starting the import process. Space in the livestock holds of most aircraft is limited so make a booking for your pet well in advance. Ensure that your pet travels in an International Air Transport Association (IATA)-approved air kennel. Try to get your pet acclimatised to the kennel before the flight so it can feel more secure during the flight. Avoid sedatives, unless recommended by a licensed vet. Most import permit applications take 10 to 20 days to be assessed but can take longer during busy seasons (such as Christmas) so it’s best to apply for a permit as early as possible. Before beginning the application process for the import permit, have all important documentation (rabies vaccination certificate, Rabies Antibody Titer Test results, etc.) ready for upload onto the BICON (Biosecurity Import Conditions) System. Make quarantine reservations at the Mickleham facility in Melbourne as soon as you receive your pet’s import permit. Spots are limited and can fill up quickly, and having an import permit does not guarantee space availability, so the earlier you apply for a spot, the better. If your pet has special dietary or medical needs, provide this information on your pet’s import permit application. You must also source your pet’s special food in Australia and have it posted to the quarantine facility along with a veterinary letter. Hopefully, we have covered everything that you need to know. In case, we have missed out on any bit of info, do visit the International Pet and Animal Transportation Association’s website. Do You Need An International Degree To Be Successful?